Another windy night and a cloudy sky this morning. We hadn't planned to do very much today. The shops in town are all shut, the British holidaymakers have bagged the Puerto de la Duquesa marina complex, and we would never go on the beach here. We spent a whole month here two years ago and never once went on there. You can imagine the state of it, when right across from the promenade is a campsite full of irresponsible dog owners. We'll say no more. After scrubbing up I did a few last minute bits of washing and hung them on our washing line. I've concluded that for £25 a night all we're getting is an excellent toilet block, a bit of electricity and good drying weather. Next was the problem of a pair of new sandals I bought for this trip. I've had to keep throwing them outside to air when I take them off. I've tried spraying them but that just leaves them covered with a white powder. Then last night it came to me - 'What kills bacteria?' I thought, answer - Alcohol. I've been carrying around a litre of cheap rum in the rear garage for ages, I think it even went to Istanbul with us. So out it came and I poured rum over the inner sole area of the sandals, and left them in the shade for a couple of hours. After that I rinsed them thoroughly and hung them up to dry. Early indications are encouraging, with the bonus that dem sandals is gonna teach me ta dunce Reggae. Yeah Mun! The Chef and I then sat down and worked our way through the guide books and using the internet, highlighted what we wanted to see in Cadiz, then marked them on the free map we got from the Tourist Information office back in Cartegena. We're still trying to come up with a cunning plan to cover the Easter period. We'll start off at the marina at La Linea at the border with Gibraltar, assuming we can get in there, and when we get fed up, we may well bite the bullet and go straight to Cadiz. I can't see too many Spaniards spending Easter Sunday etc in a glorified car park..........but then again, there are Spanish motorhomers. Lunch was toast, quite a lot of it. The baguettes go dry very quickly and rather than throw the leftovers away The Chef dishes them up as toast for lunch. This afternoon The Chef took herself off for a lie on a sun bed by the pool down by the exit gate to the promenade, whilst I got some odd jobs done. My labours were accompanied by the cries, howls and barks of a poor dog which had been chained to the fence at the pitch three down from us. The rule is no dog should be left alone at a pitch, but hey, rules are there to be ignored, especially if you want to take yourself off for a nice Sunday roast, laid on at the campsite restaurant. So sod the rules, sod the dog, go treat yourself. Then it was the repair of the door catch using epoxy resin. I dreamt about this last night. I was in the studio of Leonardo De Vinci. "Master", "Yes Leo" I said, "Teach me the art of resin sculpturing". "Well Leo" I said, "It's not that easy, it takes years of practice, brought about by working for years on low wages, and having to repair my old car myself. Now get on with your portrait, and if you don't mind me saying, you've given her a rather odd smile". First the two parts were filed down a little, then joined together using a little resin, then more resin was added in layers. As well as that a small piece of sponge was placed behind the hook on the door and an amount of resin painted over it. This, I hope, will act as a bit of a shock absorber the next time the door chooses to slam open. Drying time was speeded up by adding extra hardener and a few blasts with The Chef's hair dryer. Looking at the BBC internet news I was pleased to see that 'The Royals', were attending the ceremony at the Canadian war memorial at Vimy Ridge, in France. No doubt 'Harry' will have taken along his new girlfriend and, being American, she will have heard of Canada, and know where it is. Today, the ninth of April, was the start of a major battle fought by brave and loyal Canadian forces. In that battle there were 10,000 killed or wounded. The Canadians had to assault over an open graveyard since previous French attacks had failed with over 100,000 casualties. In WW1 control of high ground was everything, from there you could observe enemy movements, but most importantly direct you own forces artillery firepower accurately on to your enemy. In 2014 just after I retired (I know, I'm just a child) The Chef and I undertook our first proper tour in our motorhome. We spent the month of September touring France as far south as the Loire Valley, but with the primary intent of visiting WW1 battle sites and memorials. Folk may think that a little morbid, but I can tell you it was so very interesting and very humbling. Included in our trip was the monument at Vimy Ridge and the nearby military cemeteries. My word that is a very sombre, large, and powerful memorial the Canadians have there. This is now probably becoming our farewell tour of southern Spain. We don't need to come this far south in the future. We can get the weather and amenities we are looking for further north. We shall draw some lines on a map and research campsites within that area for future winter visits. Tomorrow we are on the move. Fingers crossed we'll be able to have a freebie on a piece of wasteland in the village next door for one night, then it's off to La Linea. The Chef doesn't like Gibraltar much at all, and I can tell you, she is SOoooo excited. 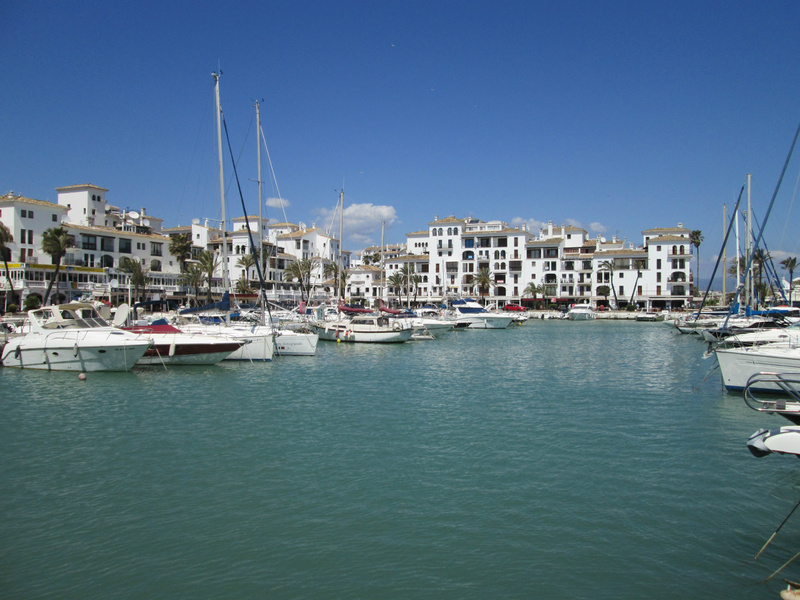 Today's pictures are of Puerto de la Duquesa, the marina complex we pass through on the way in to town. They were taken a couple of day ago when the sun shone brightly, in a cloudless sky.